I'm continually fascinated with dead vehicles and other bits of detritus that collect along the edges of our roads and highways. 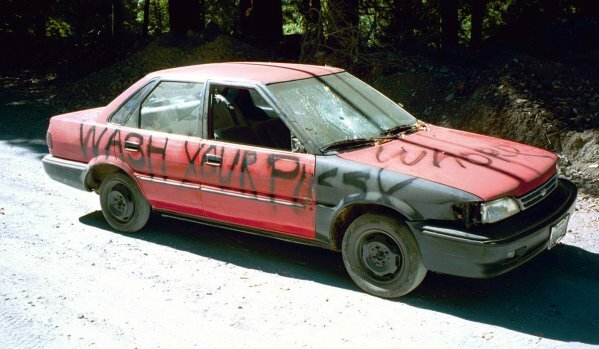 I wonder: who owned this car? What caused it to end up here abandoned and destroyed? Was it stolen? Did it lead a happy life? Did it's owner give it low self-esteem by not loving it enough? Ah well, perhaps I'll never know the answers to all these questions. The day after I took this picture, someone had spray-painted out the p-word on the side of the car (but not what was written on the front). I don't have anything against profanity (in fact I rather enjoy it). However, I have to be careful what words I put on this web site because the search engines see everything. If you put something weird or perhaps offensive on your site, bored 12 yeer-olds (what we now call tweenies) in public libraries will type those word into google, find your site, and write all over it with those cool markers that smell like blueberries. See the page SteepCliff for an example that caused me problems. Originally the name of the page contained the words in the photo. I had to change it when too many people started using those words to find my site. The internet is sick, man.